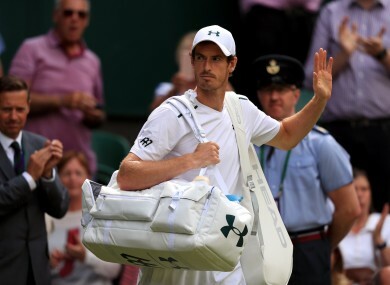 ANDY MURRAY SLAMMED the “unfair” Wimbledon scheduling as top women players were shunted onto the outside courts on “Manic Monday” — while the big four of men’s tennis took centre-stage. The world number one joined Venus Williams in calling for earlier starts to allow two men’s and two women’s matches on the big show courts, Centre Court and Court One. The All England Club defended the scheduling, saying the men’s big four — Murray, Roger Federer, Rafael Nadal and Novak Djokovic — were the marquee players that broadcasters and spectators wanted to see most. “I don’t think anyone’s suggesting it is fair. I’m not suggesting that it is,” defending champion Murray said. “Ideally you would have two men’s and two women’s on Centre; potentially starting the matches a bit earlier would allow for that. Murray suggested finding an equal split across the tournament, with the balance between men and women matches dependent upon the day’s matches. Starting the Centre and Court One matches earlier and splitting them equally — “It’s not the hardest thing to do”, he said. Wimbledon’s Manic Monday, when all the men’s and women’s last-16 matches are played in one day, is unique among tennis’s four Grand Slams. Murray and Federer’s matches were put on the 15,000-seater Centre Court, with Nadal and Djokovic on the 11,000-capacity Court One. They were joined by five-time champion Venus Williams on Centre and British home favourite Johanna Konta on Court One. That left world number one Angelique Kerber on the 4,000-seater Court Two facing fellow former runner-up Garbine Muguruza, followed by ex-world number one Victoria Azarenka against world number two Simona Halep. On the 2,000-seater Court Three, two-time Grand Slam champion Svetlana Kuznetsova faced former Wimbledon finalist Agnieszka Radwanska, followed by ex-world number one Caroline Wozniacki. Meanwhile the new French Open champion Jelena Ostapenko was on the 1,000-seater Court 12 show court. All England Club chief executive Richard Lewis said Manic Monday meant big name players would not get on the main courts. “You’ve got four of the all-time great male players: Rafa, Roger, Novak and Andy. You’re left with some difficult choices,” he told reporters. In the opening seven days of play, 14 matches on Centre Court have been from the men’s singles, while only eight have come from the women’s. Play starts at 1:00pm on the two main show courts, 11:30am on the other courts. The sun sets in London around 9:15pm during the tournament and only Centre Court has lights. However, Lewis ruled out Williams and Murray’s suggestion of four matches on Centre and Court One with an earlier start. Eighteen-time Grand Slam champion Chris Evert called for three men’s and three women’s matches across the two main courts. “It’s equal prize money so why not equal representation?” the 1970s great said. On her court placing for her match against Elina Svitolina, Ostapenko said: “I think I deserve to play on a better court than Court 12. Svitolina, however, said she did not think the scheduling “unfair”. And Magdalena Rybarikova, who triumphed on the 800-seater Court 18 — the fifth and smallest show court — backed Monday’s schedule. “I enjoy watching men’s tennis more,” she said. Defending the Manic Monday format, Lewis said it gave fans with cheaper outside court tickets the chance to see bigger-name players. Some consider it the best day’s programme of tennis in the sport’s entire annual calendar. Lewis also recalled that Wimbledon — again, uniquely among the majors — had stand-alone ladies’ quarter-final and semi-final days on Tuesday and Thursday. Email “Andy Murray slams 'unfair' Wimbledon in sexism scheduling spat”. Feedback on “Andy Murray slams 'unfair' Wimbledon in sexism scheduling spat”.